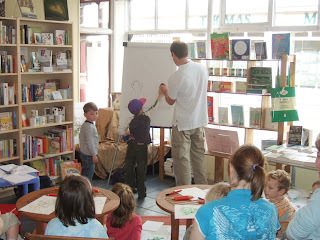 Today we held out first "interactive" children's author event. 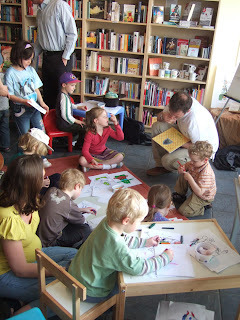 By interactive, we mean - getting the kids involved (ah, Internet jargon, I love it). 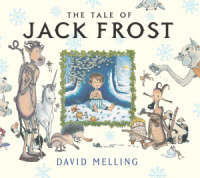 David Melling is a star children's illustrator and author or several critically-acclaimed children's books including Jack Frost, The Kiss That Missed and the Fidget and Quilly books. He also happens to live in Abingdon, so hits pretty much all our targets in terms of our perfect author. 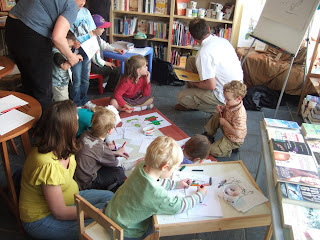 We laid on copious amounts of pens, pencils, crayons, paper and some splendid original artwork provided by David for everyone to colour in. 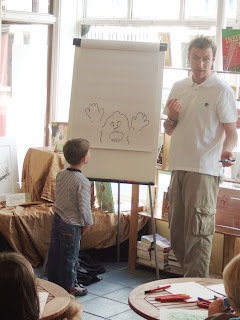 David was a bit nervous, he'd only done this type of gig in schools, and this was his first bookshop. 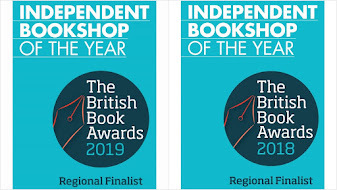 I was also nervous and twitchy (big author, had I taken too many bookings, plus ever so slightly sleep-deprived after recent momentous events). But...David was a big hit and everyone had a great deal of fun. David started off reading from The Kiss That Missed - and talking about where his ideas come from. He sketched along the way. ...to create a new character. (not sure what the young chap thinks of the result). We're getting a good feel for how events work best, and having a formal/informal split to proceedings is working really well. 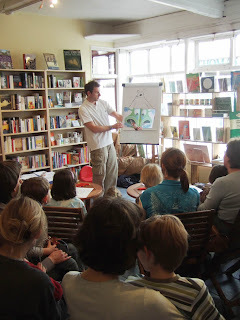 It lets us have a initial, scheduled and well-planned format, which we can run for 30 minutes to an hour, then people who need to go can slip away, and others can stay and chat to the author during the informal bit. And we also had a question and answer session as well. Congratulations! It looks like a fabulous event. 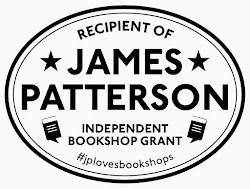 I am also thrilled to see a book store with so much natural sunlight. Wishing you many happy returns of these interactive events! Thanks Andrea - of course, it could just my poor camera technique which overexposes the light that does come in! Thanks for a lovely couple of hours, Mark and David. It was a pleasure to meet David and hear how a couple of my children's favourite books evolved from an idea through to the finished product. It was also fab to hear the new Two by Two and a Half, and browse the rest of the selection. My youngest picked up Good Knight, Sleep Tight, had to held up to the scanner and has barely put it down since. It's an absolute corker - every bit as good as its wonderful prequel, The Kiss that Missed. 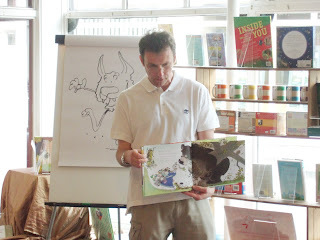 I also treated us to a hardback copy of The Scallywags which follows a family of lollopingly appealing wolves trying to teach themselves to behave politely with limited success - as ever David's illustrations are gorgeous, accompanying a fun story is fun which is just that little bit different.